Now, gentlemen, around this time you could ask whether you’re real or fictitious. I, however, think that’s too easy, so I won’t ask that yet. It has been quite a quiet few weeks – end of term, Christmas, Podcasts of importance … many nights considering what would be and could be my Top Films of 2009 and, to be honest, the idea of deciding on a best film of the decade is too daunting to consider. Off the top of my head – and I am sure I will forget some – I am thinking The Village, The Lord of the Rings and, to go a bit international, I might throw in Amelie in there. 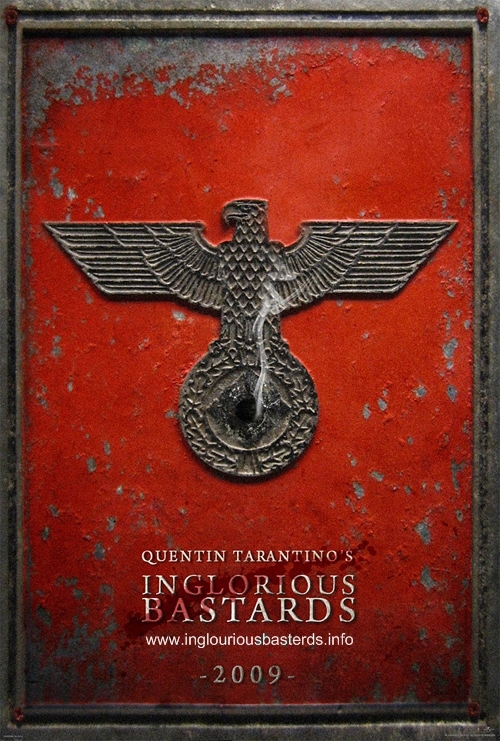 Fact is, I decided as Best film of 2009 as Inglourious Basterds. It was tough – and for a while, Woody Allen’s Vicky Cristina Barcelona got a look-in. I didn’t want to go all pretentious and choose a film that, though good, I was unlikely to see again (Thats Anti-Christ and Kinatay out the window) and then again, I didn’t want to choose anything too, though enjoyable, was nothing new or groundbreaking. I felt IB was a film that did break new ground – in Tarantino’s unique way – while at the same time was highly enjoyable. Anyone who has had a listen to the podcast knows, Let the Right One In came close but this nabbed it mainly on the grounds that I didn’t see its quality coming at all. The pulicity was mediocre but I left the cinema thoroughly entertained and enthralled about the future of Tarantino! There are very few auteurs in cinema at the moment. A director who – from the first reel – has their name stamped all over the film. These directors often write the films also – possibly from other source material – but they make the story is their own. Terence Malick, M. Night Shyamalan, Pedro Almodovar and Roman Polanski are a few which come to mind. Quentin Tarantino is another. In fact, as soon as a character speaks, you can tell Tarantinos influence; there truly is no director working in Hollywood who can create a film in the same way. Even the flawed truly “Grindhouse-for-the-noughties” Deathproof has a script and film language that no other filmmaker can recreate. In the introduction, we are introduced to one of the two lead male roles; Christoph Waltzs’ Col. Landa – the ‘Jew Hunter’ (The second is Brad Pitt’s Lt Aldo ‘the Apache’ Raine). Landa is an exceptional ‘hunter’ as he finds the family of our lead character Shosanna (Melanie Laurent), who manages to escape his grasp. Akin to ‘The Bride’ in Kill Bill, the film is about revenge. A revenge that Shosanna holds towards the Nazi’s – and as she is hosting a premiere of Nations Pride at the cinema she has bequeathed from her auntie and uncle, it is the ideal opportunity to take them out. This premiere has in attendance (amongst many other high-ranking Nazi’s) Goebbels and Hitler himself. Running alongside her revenge plot is also the Basterds plot to end the war. Raines is the leader of the Basterds and, through the assistance of the British Army, they also intend to use the premiere as an opportunity to knock-out the enemy. If they wipe all four leaders out, they end the war. The more you watch the film, the more you realise how intricately paced Tarantino has made the film. Take the basement bar-sequence as Lt Hicox, Stiglitz and another basterd are meeting up with von Hammersmark. As soon as the basterds arrive, there is a subtle show of power building from one character to another – beginning at the moment the German-female headlocks a low-ranking German soldier. It estalishes her power over him, only to then be interrupted by a different soldier ‘drinking-to’ Wilhelm (this supercedes her power), this then leads to Wilhelm (who had just been championed, as drunk as he was, he was in a position of power), approaching Hicoxs’ table to be very swiftly knocked down to size as Hicox and Stiglitz tell him to leave the group – as a viewer we are now clear in the knowledge that Hicox and Stiglitz are the most powerful characters in the room – the fact that Stiglitz defends Hicox implies Hicox stronger is than he … until Hellstrom is revealed. We are wholly aware that it is he who assumes power over everyone – even pushing Stiglitz to the side, placing himself ‘up there’ on a par with Hicox and Stiglitz. This very gradually builds the tension – even though the German girl we first see, we know, has no real purpose except for beginning this play of power gradually. Prior to the German girl-on-guy head-lock, we see the quiet, shy exceptionally-weak French girl who is embarressed by playing the game with the German soliders, backing up this structure I believe Tarantino adhered to. The sequence is finished as von Hammersmark kills Wilhelm – while everyone else lays dead. von Hammersmark, though she has parallels with Shosanna, she is nowhere near as cunning or strong as Shosanna – linking to another focus for analysis in the sequence whereby Landa kills Hammersmark. Upon using the shoe, in a Cinderella-like fashion, Landa leaps onto her, straddling her body and strangling her to death. We can assume there may be a pleasure in this – but it is also grotesque. Her legs flailing around the place as she gasps for her last breath. He is ashamed of her and what she has done. Hammersmark is a character with no pride for her country – she had no qualms about killing Wilhelm (even though Raines – we can assume through the conversation – hoped to keep him alive and even Hellstrom mentions when his life is at stake how Wilhelms life, to some extent is valuable. Hammersmark doesn’t see it as valuable and kills him with no problem whatsoever – and she is clumsy enough to leave her shoe and go to ‘the ball’ (the cinema) anyway with such a lame excuse as to the mountain-climbing accident and bring along her ‘Italian’ friends. Aldo Raine even thought the meeting place in a basement was excpetionally bad planning. This lack of skill and clumsiness is everything Landa is not (note how he is exceptionally scathing towards Hammersmark when Raine asks about her) – and so he takes her life with a lot more gusto and makes the entire sequence that much more violent. Aldo Raine on the other hand is met with respect – Landa respects and admires him, thus saving his life. The end of the film has been spoken about a lot. I don’t think, as Chris Hewitt says in Empire that Tarantino is ‘playing God’ by reimagining history the way he does, but Hewitt is right in stating that it is ‘bold and outrageous’. Part of the reason that I think it is ground-breaking. Nick James, obviously, is a little harsher telling us how the film is a ‘too-complex plot’ replete with ‘low-level black humour’ as some sort of ‘wish-fulfilment Jewish revenge fantasy’. Though, maybe someone with a Jewish background and potential links to the atrocities of Hitler may see it that way, I doubt the vast majority chanted ‘yes!’ as Hitler was killed. The reality is, whether he was killed or not – it doesn’t matter. The sequence was black-humour as it should be. What matters is what happened afterwards – and thats the message of the film. What scars are left on the accomplices of Hitlers Nazi campaign? I feel that, at many points, the basterds are out of place – like a bunch of contemporary figures dropped into Nazi-occupied France. They are not making dreams real – they are raising questions about what is right and what we have missed. In any war, the soldiers are what they are – following orders – but they are still the killers who killed the enemy, they are still the man comitting the legal-crime. It reminds me of a Band of Brothers episode whereby a character has an argument with a baker when the baker argues he was unaware of the stench of dead bodies from a nearby concentration camp. The character is shouting at the baker – how on earth could he not have known? He was ignorant and he pretended he was not a part of it. We are all responsible and, one man being butchered on screen (Hitler…) and even the entire cinema burning down with all the Nazi officials inside, does not get rid of the ‘stench’ of horror that lingers. What happens to the people who ‘got away’ – like Landa – do they just mingle back into society post-war? An interesting, though completely different approach to the same moral question, is raised in The Reader … who commits the crime and how can we, without killing the perpetrators, enact justice on those at fault? The scars are permanant for the victims, yet in the passing of time they fade into the back of the mind of the perpetrators. While I disagree with you about Inglourious Basterds (it's a mess, albeit containing some great scenes), The Village for film of the decade is a very cool and unusual choice. I'm looking forward to your first Shyamalan review. Next year's The Last Airbender perhaps?